While we were waiting for the first game of Portugal in the 2012 European championships to start, a Spanish dancer and artist walked by with a big trolley. Thinking she was a tourist looking for a place to have a coffee or a beer, I pointed out the only empty chair of the terrace at Nando’s. A while later Mónica Cofiño (that’s her name) started taking stuff out of the suitcase and asking people to participate in a video recording for a piece of her’s, Texto y Danzas para Vacas. You guessed it right, it’s all about cows. 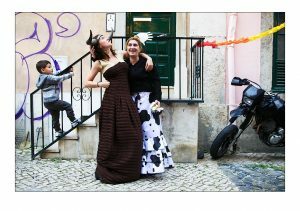 I shot this photo of her and one of the neighbors who participated in the recording, with cow hoofs and matching dress with Mónica after the first recording. Anything can happen in downtown Lisbon.